A renowned mountaineer and environmentalist received a top award from a group representing writers and photographers. Dr Adam Watson is considered one of the most knowledgeable experts on the Cairngorms, and his service was marked by the Outdoor Writers and Photographers Guild. The organisation’s chairman Jonathan Williams presented the Golden Eagle award to Dr Watson at a ‘low-key’ ceremony at Bonochry. Mr Williams said: “With the increasing pressure of man on the environment, especially as the natural world is increasingly seen as a source of energy and a place to play expensive games, as well as housing, the world is going to need more Adam Watsons – profound experts in their field – to help us manage the pressures. Dr Watson said, on accepting the award: “When I was nine, I saw Seton Gordon’s book The Cairngorm Hills of Scotland, written in 1925, for the first time. And that book changed my life. “Opening it, I could see there was something special. “I’d been to Deeside and Speyside with my parents on holiday, but I can’t remember much about it. “But once I opened that book, it was like switching on a light in my head. And I saw the whole place differently, the people, the wildlife and so on. He subsequently corresponded with Seton Gordon and, at the age of 13, accompanied him into the hills. With no local mountaineering club, the young Adam Watson ventured into the mountains alone, noting weather conditions, rockclimbing and sketching. In winter 1947, by chance, he met mountaineer and writer Tom Weir – himself a Golden Eagle award winner, in 2001. Mr Weir introduced him to skiing, enabling him to extend his winter explorations further into the snow-covered mountains. “That was another revelation,” Dr Watson said. “With Tom I had some great days after that, skiing and ski-mountaineering and rock-climbing. 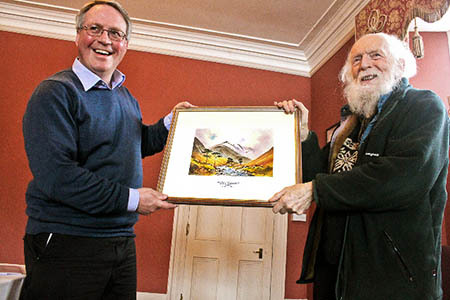 The award took the form of a landscape of Luibeg Burn in the Cairngorms, close to where Dr Watson first met Tom Weir, painted by OWPG member and artist David Bellamy.